Every once in a while, something very special comes along in the world of quilting. Sometimes it's a magical new tool or and innovative feature on a sewing machine which takes a bit of the tedium out of preparing a quilt (or reduces headache-inducing problems like bobbin issues, misaligned seams, or painful cutting mishaps). But sometimes, it's something incredibly simple that can remind you why you love quilting so much in the first place. 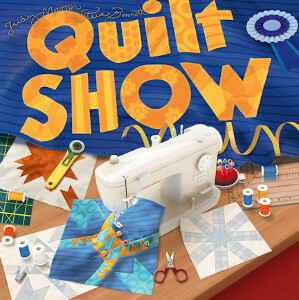 Quilt Show, the new board game from Judy Martin, does just that. The game is designed to appeal to the most fun aspects of quilting: choosing your patterns, assembling the template, and showing off the finished product. The twist, of course, is that in Quilt Show you are competing not only with yourself (to make the best possible block in your allotted time with your available resources—a dilemma all quilters are familiar with!) but also with the other players, all of whom are trying to make the best possible quilt blocks before the show. The game combines savvy, design, and good old-fashioned competitive spirit for a game that's perfect for quilt guilds, rainy days, or parties. What's more, perhaps without intending to the game functions as a perfect way to introduce newcomers to the art and community of quilting. How many times have you sighed to yourself that many of your friends and family just don't "get it"? To them, quilting is all tedium and fabric hoarding. But Quilt Show allows them fall in love with the art. The reasons for loving Quilt Show are many, particularly if you're a quilter, but what they all boil down to is simply: it's fun! It's a game that will have you laughing, designing, critiquing ... after all, what better way is there to pass an hour than assembling a quilt? My favorite quilt is the Crazy Quilt - you can go wild making it or do a old time traditional one. The game Qult Show sounds fascinating. I love Crazy Quilting - you can make it modern or use the traditional old timey pattern. The Quilt Show Game sounds fascinating. I like nine-patch best. They're easy to do and don't take a lot of fancy stitching. Scrappy quilts are my favorite.